There`s only a bit over a month until the year is over and I`m freaking out! Although I am doing well in terms of my Goodreads challenge, I did not read as much as I wanted to. Instead of finishing series, I started even more. Like all bookworms, I`m hopeless, and the buying vs. reading ratio is not in my favour. So let`s do what everyone else does and try to make it up in the last days. That always works (cue sarcasm). Anyway, here are the top ten books on my Winter TBR. I`m in the middle of my Harry Potter readathon and originally I wanted to wait for Santa to bring this book. But I caved in and broke my buying ban (no self-control whatsoever). Jim Kay does some fantastic illustrations and if you can get your hands on these copies, I can promise you that you won`t regret it. They make the whole reading experience more magical if that`s even possible. Also, if everything goes according to plan, I`ll finish all of the Harry Potter series by the end of February. I wasn`t as crazy about "Shadow and Bone" as everyone else, but I highly enjoyed it. I liked the world Bardugo created and I absolutely loved the Darkling. Alina was OK as a protagonist, though I got a bit annoyed with the back and forth between the Darkling and Mal. But I really want to continue on with the trilogy and see what happens. I really hope that I can finish this trilogy before the end of 2017. Everyone has been telling me that this is better than TMI (which I love/hate) and I have mixed feelings about that. I can see an improvement in the writing style, but Tessa is just as obnoxious as Clary and Will is definitely worse than Jace. The only redeeming thing is Jem, who`s a babe. Funny enough, reading "Clockwork Angel" made me realise that I don`t hate TMI as much as I thought I did. I mean, I still have many problems with it, but at least it`s filled with characters that I love like Simon, Izzy, Magnus and Alec. You all know how much I love Patrick Ness` writing, so it`s about time I start the "Chaos Walking" trilogy. I also know that they`re making a movie out of it and I`d love to finish the books before I see the adaptation. Whilst I`m familiar with her feminist work, I can`t say that I know much about Chimamanda`s historical fiction novels. They do seem to have impressive ratings on Goodreads, so I`ll give them a chance and see how that goes. What did I tell you about starting series before finishing others? I`m hopeless. This series has some mixed reviews on Goodreads and I am a bit wary of that. But it`s with dragons!!! I`ve decided to include a Christmas related book in here because I don`t want to be a total Grinch. Cute YA contemporaries are not really my thing, I`ll admit. But I work a lot around Christmas, so a fluffy contemporary might cheer me up and save me from a reading slump. Are any of these books on your list? Or if you`ve already read them, which one do you recommend most? Don`t forget to leave your links in the comments so I can check your list. You've got some great books on here! I love Leigh Bardugo's Grishaverse, after finishing this series you should really read the Six of Crows duology, they are AMAZING! You totally got me with the fluffy Christmas read :) I for one, am a biiiig sucker for them. Would read them in summer if it were socially acceptable. xD Your first picture totally makes me want to read the Harry Potter series. I love your picture of all the Harry Potter books! So pretty! I've been wanting to do a reread, but I just haven't gotten around to it yet. I agree with Isabelle. "Half of a Yellow Sun" sounds particularly intriguing. Here is our Top Ten Tuesday. Thanks for stopping by earlier! HARRY POTTER <3 - should've added that one to my list as well, lol. I despreately want to do a re-read of the series by starting with the Illustrated editions. I have to continue the grisha trilogy as well. I liked Shadow and Bone a lot, can't wait to see how everything will develop in Siege and Storm. the back and forth between the Darkling and Mal was indeed something that wasn't particularly nessessary I think, in that amount, as well. AND OOOMFGGGG YOU NEED TO FINISH THE INFERNAL DEVICESSSSSS..
- They're my BABIES so don't mind my major fangirl rant here buwhahaha. The trilogy only gets better and better with each book. Book three ripped my freaking heart out. I have spots in my book - and I'm normally always so careful around my books - from my UGLY CRY moments, which happened A LOT haha. So yeah, good luck ;) I think this is the only love-triangle that's written to perfection, for me. I see you're not overly fond of Tessa and Will though haha so I'm going to keep quiet over here, lol. since there are a lot of references back and forth with TID-TMI and it makes your reading experience even better of City of Heavenly Fire. I really liked Talon and definitely liked it enough to read on in the series. I've had the opportunity to meet Julie when she was in Holland last year and she's such a kind and awesome person. Did you see the figurines she makes herself? THEY ARE SO FREAKING AWESOME! The illustrated Harry Potter books look so stunning! lol I love your comment about not wanting to a be Grinch but that YA contemporaries aren't really your thing, they aren't mind either so I can totally relate. I do hope you enjoy Dash and Lily`s Book of Dares though and that it brings some lightness to the busy-ness that comes with working during the holidays! I love your photo at the top. My husband actually bought me 2 and 3 of the illustrated ones this month and they are so gorgeous. I read Talon earlier this year and haven't gotten around to picking up the other two I have of the series. It dissapointed me a lot. Despite dragons. ._. The illustrated HP's look so nice! And I wanted to read Dash and Lily's and never got around to it- maybe this Christmas would be a good time! Yay for reading Harry Potter. I love those books. I read the first illustrated one last year and this year I was gifted books 2 and 3 so those are on my Winter TBR too. 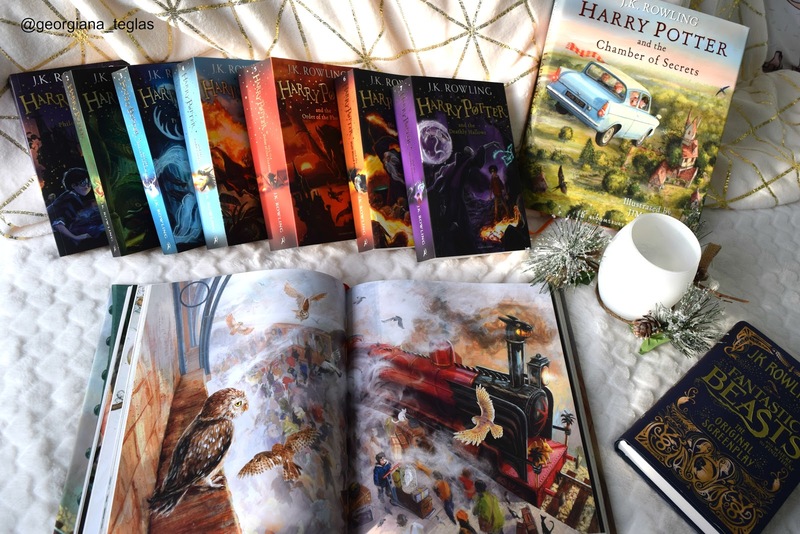 I so want to get the illustrated HP editions!! I don't blame you at all for coveting those illustrated HP books. I bought the first one for my daughter and it's gorgeous. I also love the Chaos Walking series. It's one of my all-time favorite YA series. I hope you love it! I love Levithan and Cohn together! 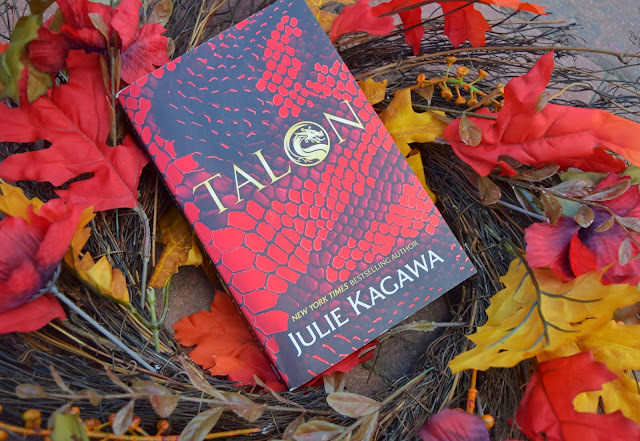 Julie Kagawa is one of my faves, and I am really enjoying the Talon series. I will read every book Clare writes, and TID is still my favorite series by her. Great TBR and fabulous pictures! I love your photos. Those Illustrated Harry Potters are so pretty. I’d love to read one someday. Ahh! I love Dash & Lily's Book of Dares! I hope it does not disappoint! David Levithan is always a great author to help pick me up from reading slumps. Happy reading! I read Talon and it was really good! Also you have to read Ruin and Rising! What a lovely Harry Potter collection. Those illustrated books really are beautiful. I've just finished re-reading Azkaban. It's such a good story, and I can't wait to re-read the rest of the series too. 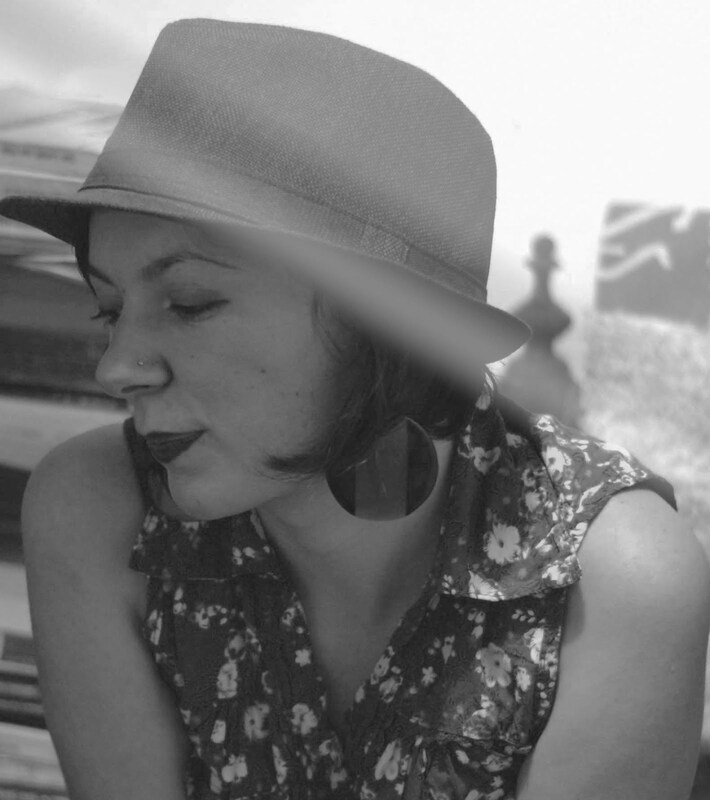 Your book photos are fab! And Dash and Lily`s Book of Dares is a lovely seasonal read. It's cute and memorable. Your Winter TBR sounds fantastic, especially the HP readathon. That is a series I never get tired of. My hope to catch up on some of my series reading this year was a failure. Like you, I seemed to pick up new ones . . . Oh well. We can work on it this next year, right? Two of my favorites made your list this week, and I'm so excited you will be reading them. You must read them, pretty please! Half of a Yellow Sun and The Knife of Never Letting Go. Talon is on my TBR pile to read. I hope you get to most, if not all of the books on your list for winter! Hope you enjoy all of these books! I've been looking at 'Dash and Lily' quite a bit this past month, but I haven't picked it up. It sure looks cute, but for some reason I just haven't gone ahead and snagged a copy. Maybe... someday!